You've got to love Bank Holidays and the like for the chance to explore your local area. We seldom go far if we can help it. Why waste time sitting in the car? And I thought I'd share this little gem with you this morning, being just a couple of miles up the road from where we live, making it a perfect Bank Holiday destination. Yes, it's Baby Jake's windmill. 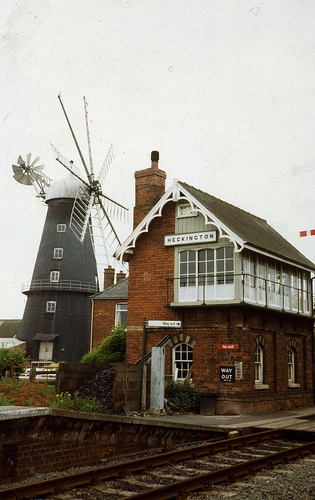 Ok, they've added a few more windows on the telly but this is it alright - Sibsey Trader Windmill, built in 1877 and described as 'one of the finest mills in the country.' Actually, we're quite well off for windmills in our part of the world. 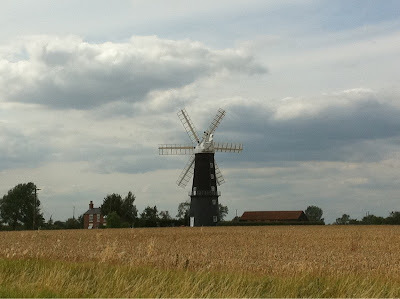 There's the Maud Foster mill about half a mile away and which distracts me from work whenever I gaze out of my study windmill I mean window. Then a few miles down the road is the Heckington Windmill, a mill so unique it gets mill-spotters (if such should be) salivating at the very mention of its name. You see, it's got eight sails! And I can't recommend the view from the train as it slows to a halt at Heckington station highly enough. Of course, you could get off and take a look. But in spite of passing it on a regular basis as I commute to work I never have. Typical, isn't it? Oh well. At least that's the next Bank Holiday taken care of. ... I'll give you a tour of the area Steve!